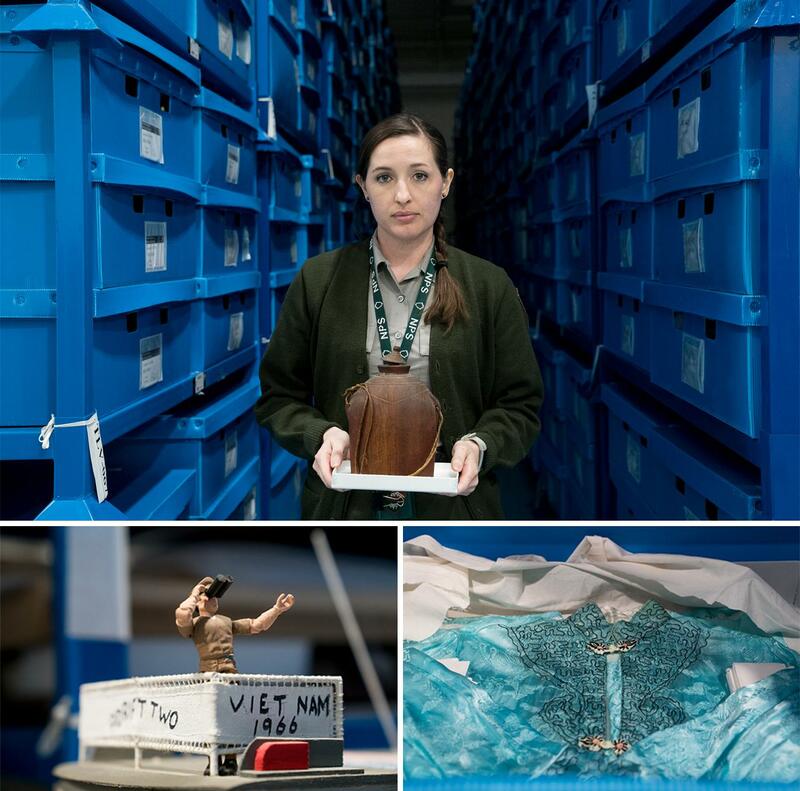 (Above) Janet Folkerts, curator for the Vietnam Veterans Memorial museum collection, holds a container of unidentified cremains at the Museum Resource Center in Landover, Md. (Below) A 3-foot-tall model of a U.S. watercraft (left) and a traditional Vietnamese dress are among the artifacts left at the wall that have become part of the permanent collection. 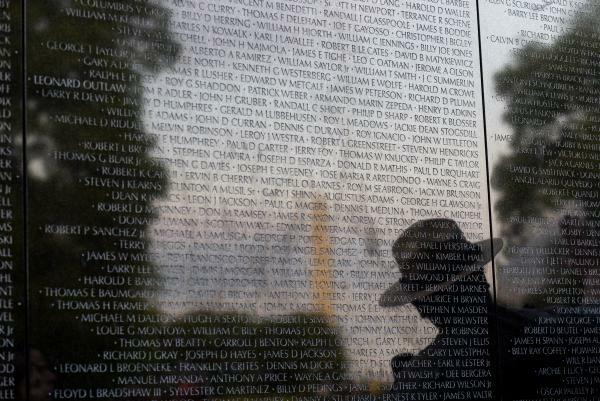 Visitors walk along the Vietnam Veterans Memorial. A new sign warns visitors that human remains left there will not be added to the memorial's permanent collection. 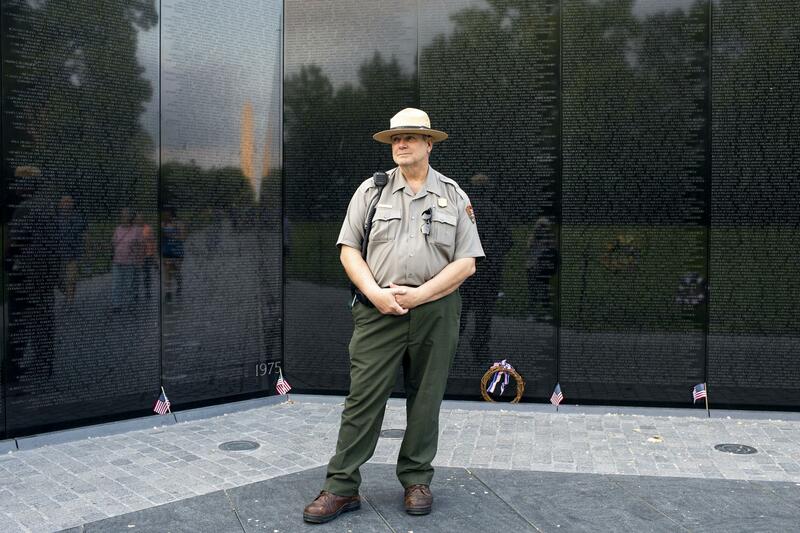 Robert Herendeen, National Park Service ranger, speaks to visitors at the Vietnam Veterans Memorial in Washington, D.C. Rangers like Herendeen have the task of collecting items left at the wall — including human remains. Herendeen says he feels torn about the best thing to do with the ashes left at the memorial, where he has worked for six years. Barbara Otterson says she brought the cremated remains of her husband, James Gooderum, to the Vietnam memorial because it was "the closest (she) could get to the place that he felt most at home, with his brothers in arms." The National Park Service says it does not have the capacity to properly care for human remains and that it is seeking a solution through discussions with the Department of Veterans Affairs and a veterans group. On this spring night, there's something else left behind. To the untrained eye it doesn't look like much — a few teaspoons of dirt or ash. But after six years working as a park ranger at the memorial, Herendeen immediately recognizes what it is: human remains. 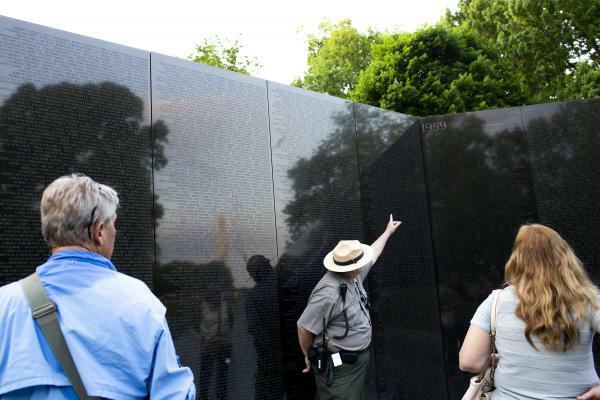 About once a week, Herendeen says, he comes across scattered human ashes at the wall, inscribed with the names of 58,318 U.S. service members believed to be dead or missing after the Vietnam War. It's a difficult part of his duties. More personal items, like medals and dog tags, are gathered up and curated; some become part of the memorial's permanent collection. Unlike those mementos, the cremains can't be added to the collection. "You realize on the one hand that this was somebody's last wish to have their remains placed here on the wall," he says. "The law does not allow us to do that, so we have to follow a protocol, clean up the ash and remove it. It has to go into a hazardous waste disposal." The memorial was dedicated in 1982, and people have left cremains there — either scattered or in containers — since 1990. But for the last couple of years, it has been happening more frequently. The generation that served in Vietnam is aging — the youngest combat veterans are now in their 60s — and there was a particularly noticeable uptick after the 10-part documentary The Vietnam War began airing on PBS stations in September 2017. 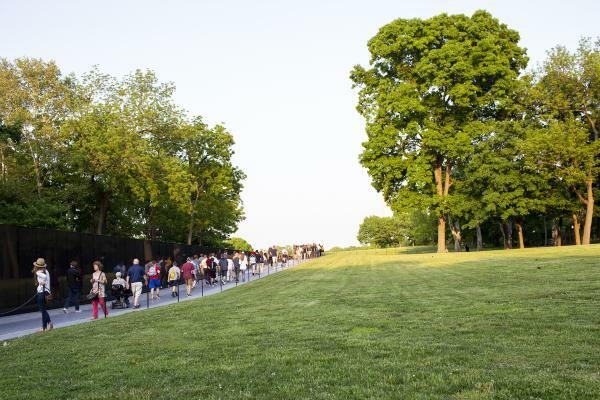 Now, the National Park Service, which is in charge of the memorial and the associated collection, is trying to discourage people from leaving cremains at the wall. Last fall, a new sign went up, warning visitors that the scattering of human remains is prohibited and that the ashes will not become part of the permanent collection. Visitors to the website of the memorial's permanent collection are given the same warning. The park service says it isn't equipped to care for human ashes and it is in discussions with veterans' organizations to find a permanent home for the cremains in its possession. While scattered ashes are disposed of, containers of ashes are taken to the vast warehouse at the National Park Service's Museum Resource Center in Landover, Md., outside Washington. There, items left behind at the wall are stored on rows upon rows of shelves: carved walking sticks, footballs, sculptures and blue boxes containing photographs, letters and other mementos. The collection holds as many as 300,000 items, collected from the foot of the memorial since its dedication, many of them tied to names on the wall. But the cremains are not part of that permanent collection. "The things we have here are objects that tell a story," says Janet Folkerts, curator for the Vietnam Veterans Memorial museum collection. "But those [remains] are people, and we are not a mausoleum, and we are not a crematorium or a gravesite, so we don't have the capacity to take care of them in the way they should be taken care of." The ashes and their containers are kept separate from the rest of the collection, in a locked cabinet, its glass windows covered with brown paper for privacy. "So we don't have people just walking by and ogling," says Folkerts. Inside the cabinet are all sorts of containers: traditional urns, tins that look like they might have once held chewing tobacco, carved wooden boxes, a bandoleer with little glass vials of ashes in place of ammunition. There are at least partial remains of about 70 people. Some are marked with names, some are anonymous. There are poems and epitaphs — not all of them reverential. One of them reads: "My wife has a drinking problem: me." To Jimmy: Jim carried the weight of your death every day of his life. He blamed himself for your child never having known you. He blamed himself for being in the hospital with malaria, instead of having your back when the attack came that took all your lives. The belief that he could somehow have saved you never left him. Misguided as it was, Jim never really left Nam. It took him too, in the end. So I'm leaving him with you. It's what he wanted. I hope you're both smiling and at peace now. 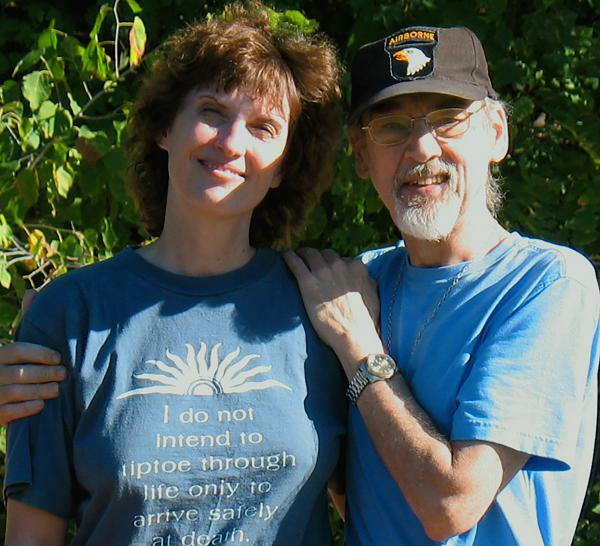 Barbara Otterson, now 67, left that letter at the memorial in 2014, along with the cremains of her late husband, James Gooderum, who died at age 64. It was more than a year after his death. She was packing her life into an RV and preparing to leave home in St. Louis and travel the country year-round, and she didn't know what to do with the ashes. So she took them to the memorial. "It's a place he always wanted to visit, but due to the severity of his PTSD he could never bring himself to go there," Otterson says. "So, I took him later." Otterson says her husband had always talked about the friend he'd lost in Vietnam, James "Jimmy" Elder, but could never bring himself to reach out to Elder's family. "I don't know, it just seemed appropriate to leave him with his friend," she says. She knew that items left at the wall were collected and archived, but she didn't know what would happen to her husband's cremains. "I guess I just assumed that the ashes would probably at some point end up in a military cemetery mausoleum," Otterson says. "Beyond that I hadn't really thought about it." Laura Anderson, curator for the National Mall and Memorial Parks, understands why loved ones feel compelled to leave remains at the wall. "A lot of people think of the site as sacred," she says. But it has put the park service in a difficult position: having to determine the most respectful, honorable way to care for remains that may not even be identifiable. "It's not a decision that [curators] Laura or Janet or the rangers on the ground should be the ones making," says Mike Litterst, a spokesman for the National Park Service. "It's a decision — the final resting place of a loved one — that should be made by the families." The park service has had discussions with the Department of Veterans Affairs and a group called the Missing in America Project, whose mission is to inter the unclaimed remains of U.S. veterans, about finding a home for the cremains at a veterans cemetery. That option, too, is fraught. To be interred in a national cemetery, the deceased person's military record needs to be confirmed. And Folkerts points out that can be difficult or impossible "if we only have a first name, we only have a last name, we only have a nickname," or if they don't have a name at all. In the meantime, despite the sign, people continue to scatter ashes at the memorial. To Otterson, the widow of U.S. soldier James Gooderum, it felt like the best, most natural way to honor her husband and connect with a defining time in his life. "It's the closest I could get to the place that he felt most at home, with his brothers in arms," she says. "I don't know any other place you can take them other than the wall." Connor Donevan and Renita Jablonski produced and edited the audio story. Maureen Pao produced and edited the online story. This Memorial Day, my co-host Ari Shapiro brings us a story of one of the lives that was shaped by the Vietnam War. We begin at the Vietnam Veterans Memorial here in Washington as evening falls. ARI SHAPIRO, BYLINE: By this time of night, the masses of school field trips have slowed to a trickle. And a National Park Service ranger makes the rounds, picking up items that have been left behind at the base of the wall. On this night, that ranger is Bob Herendeen. BOB HERENDEEN: I'm just going to start right at the beginning here, guys, and just go straight down, OK? SHAPIRO: With a flashlight in one hand and a clear plastic bag in the other, he surveys the things people have laid at the wall during the day - American flags, wreaths, flowers. HERENDEEN: This is a note from a young person. SHAPIRO: Sometimes school groups write letters to fallen soldiers. More personal items like canteens and dog tags will be catalogued and archived. About once a week, the ranger comes upon something deeply personal that cannot be added to the permanent collection. HERENDEEN: So I will point this out to you guys right here. These are human remains. SHAPIRO: Oh. It just looks like ash to me, but you can tell that these are cremated remains of someone. HERENDEEN: This has become a more common occurrence at the wall. We can't - you know, it's a difficult thing because you realize, on the one hand, that this was somebody's last wish to be - have their remains placed here on the wall. We have to follow protocol and clean up the ash and remove it. It has to go into a hazardous waste disposal. SHAPIRO: Last fall, the Park Service put up a sign telling people not to leave human remains here, but that hasn't stopped them. Sometimes it's more than just a scattering of ash. People have left urns. Those go to the National Park Service's Museum Resource Center in Landover, Md. JANET FOLKERTS: This is the cabinet that we keep all of our cremains in. SHAPIRO: Janet Folkerts is the curator for the Vietnam Veterans Memorial museum collection. The Park Service is working to find a respectful final resting place for the human remains that have been left at the wall over the years, someplace like a veterans' cemetery. FOLKERTS: We are not a mausoleum. We are not a crematorium or a grave site. So we don't have the capacity to take care of them in the way that they should be taken care of. SHAPIRO: One of the containers caught my eye because of a letter taped to the front of it. I began to read the cursive handwriting on the flowered stationery. The letter starts, to Jimmy. BARBARA OTTERSON: (Reading) Instead of having your back when the attack came that took all of your lives. The belief that he could somehow have saved you never left him, misguided as it was. Jim never really left Nam. It took him, too, in the end. So I'm leaving him with you. It's what he wanted. I hope you're both smiling and at peace now. And then I signed it, Jim's wife Barbara. SHAPIRO: Barbara Otterson wrote that letter four years ago. Her husband's name was James Gooderum. She left his remains at the wall in 2014, two years after he died. OTTERSON: It's a place he always wanted to visit. But due to the severity of his PTSD, he could never bring himself to go there. So I took him later. And then I knew that the name of his best friend from Vietnam was on the wall there, James B. Elder. And - I don't know. It just seemed appropriate to leave him with his friend. And I wrote a letter to Jimmy because - I don't know. My husband always wanted to reach out to his family, to the son that didn't know his dad, but he could never bring himself to do it. Again, it was the PTSD. It just - it controlled his life. SHAPIRO: By that point, it had been more than a year since he died. SHAPIRO: Was it still a very emotional experience for you? OTTERSON: It was harder than I thought it would be. It was a lot harder than I thought it would be. I thought I was ready for it. I thought I'd been through all the grief and all the emotion. But after I left it, I cried for an hour. SHAPIRO: Was it over the loss of your husband, or - I guess I should - it sounds like an obvious question, but what were you crying about for that hour? OTTERSON: The waste of a life. He never recovered from the three years he spent in Vietnam. He never was whole again. OTTERSON: He missed so much that he wanted to do that he couldn't do. And a lot of dreams that we had just - we couldn't get there because of the emotional trauma. SHAPIRO: Your letter sort of explains the story, but clearly there was one firefight where James Elder, Jimmy, was killed while your husband was in the hospital with malaria. That was kind of a pivotal moment in Jim's life. Do you know when and where that took place? OTTERSON: Not exactly. I know that my husband's biggest problem was that the medics would not really take your temperature or examine you or anything just for having malaria unless you started vomiting. And he had become so weak that he lied about having thrown up so that they would take a look at him. And as it turned out, he had a fever of over 104, and they medevaced him out. And because he lied to the medic, he somehow decided that that was why Jimmy was dead. That if he hadn't lied to the medic, if he had somehow toughed it out with a fever of 104 and went on with his fireteam, that he would have made the difference. And that they were all dead because of him. SHAPIRO: How did your husband's PTSD express itself? OTTERSON: When I first met him, he couldn't go out of the house for a week before and a week after 4th of July because of the firecrackers. If there was a loud noise, I'd usually find him on the ground and in the gutter or behind something. And this was 20 years after coming back from Vietnam. If it rained and it rained hard and long, he couldn't go out of the house. He would become so severely depressed that he was non-functional because it reminded him too much of the monsoons. It expressed itself just about every way you can imagine. SHAPIRO: You've talked about the things that made your husband's life so challenging. I don't want to end without giving you an opportunity to tell us about the wonderful things about him, the things that you loved about him, the things that you'll always remember about him. OTTERSON: He loved to sing. We used to sing together all the time. He loved animals. He was a good Christian man. He cared. He cared very deeply. SHAPIRO: Barbara Otterson left her husband's ashes at the wall long before there was any sign telling people not to. She says it's the closest she could get to the place he felt most at home with his brothers in arms from Vietnam. (SOUNDBITE OF NICK DRAKE'S "HORN") Transcript provided by NPR, Copyright NPR.